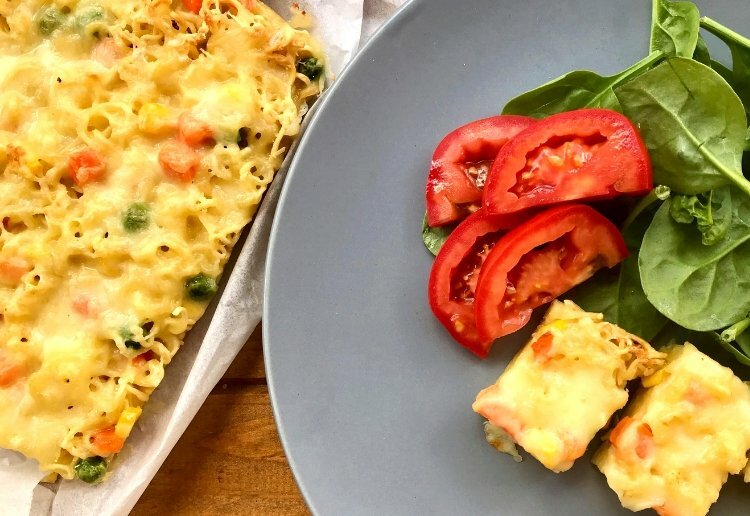 Whip up dinner in a flash with this Noodle and Vegetable Frittata. With only 4 ingredients and 30 minutes you can have dinner on the table in no time (leftovers are perfect for the lunchbox too)! Beat the eggs, season with salt and pepper then stir through the noodles and veggies. Notes... This is great too for lunchboxes and snacks as it can be eaten cold too! A great idea for a quick meal, think my older sons could even cook this. I actually didn’t realise people still ate 2 minute noodles. This is brilliant!! Simple but definitely child enticing with the noodles. I will be trying this for school lunch boxes. A good frittata for lunch boxes, picnics and outings. my boys would love this in their lunch boxes! It’s good to change things around for them to keep them happy and interested in food! This frittata looks easy to make and the end result look oh so tasty. Frittata with pasta is a great dish indeed. You can do it with leftover pasta too. This recipe sounds interesting with the noodles in the frittata! Thanks !